There's an age old saying that a picture is worth a thousand words. The use of cartoons to represent ideas was discovered in Bangladesh perhaps around the end of the 18th century and using visual satire is a common practice within the Bangladeshi print media today. Cartoons are normally used to reflect the state of the economy, the political environment, social values and beliefs and sometimes just to humour our everyday lives. The first Bangladeshi cartoonist was Kazi Abul Kashem, who specialised in political satire. Rafiqun Nabi or Ronobi proved that a cartoon character can be turned into a phenomenon through his famous creation, a popular character known as Tokai. Tokai is a street urchin below the age of ten, who dresses in rags, is bald and has a noticeable potbelly, who represents the deprived population of Bangladesh. He has become a witty outlet for the thoughts and feelings of people regarding the political and socio-economic condition of the country. Tokai has become so famous; his name is used to describe all street children and trash collectors in this country. Bangladesh also has its very own humour magazine, founded in 1978, known as Unmad which means insane. 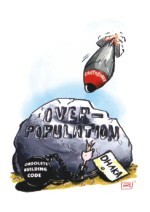 Unmad is a non-political magazine and focuses on day-to-day social issues. It is currently the only humour magazine in the country and has become one of the best selling magazines in the country's history. In today's media world, there is a high demand for cartoonists, and many of our youth are considering this as a full time profession. Most newspapers and popular magazines have in-house cartoonists and many work as freelance artists. Until recently however, there was no formal platform for cartoonists to present their work, no fixed rates for different types of cartoons. The cartoons in themselves were not considered works of art. This year, several professional and amateur cartoonists have formed a group known as the Bangladesh Cartoonist Association (BCA) to promote the interests of staff, freelance and student cartoonists in Bangladesh. 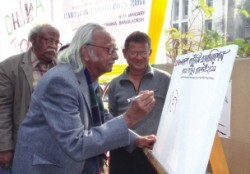 Artist Qayyum Chowdhury Inaugurating the exhibition. Artist Rafiqun Nabi and Unmad's editor Ahsan Habib are at the back. The aim of this association is to keep cartoonists connected with each other and to keep them informed about the goings on within this special circle. Members include some of Bangladesh's best cartoonists, caricaturists and comic book artists who also work for newspapers, magazines and production houses. The group will work together on matters such as rights of cartoonists, copyright issues, syndicating cartoons, promoting cartoonists to the public as well as to newspaper and magazine editors and publishers. The group also hopes to collect all the best cartoons produced every year and create an online gallery as well as publish a book to promote this profession. To announce their existence, this group has organised an exhibition, currently being held at the national press club, to display some of their prided creations. The theme of this exhibition is “Dhaka” and the cartoonists have depicted their experiences of life in Dhaka city in their work. The cartoons portray all our daily troubles, such as traffic jams, corruption, congestion, lack of clean water, electricity, gas and mismanagement of land and the threat of natural disasters such as floods and earthquakes, all in a humorous light. Some cartoons give us a glimpse of the future Dhaka in the year 2050, and the picture is rather bleak. About 34 artists are participating in this exhibition, which started on the 9th of this month and will continue till the 11th. Seventy-eight cartoons were on display. Among the artists were Ahsan Habib, the editor of Unmad, Shahriar Khan, Rezaun Nabi, Mehedi Haque from the New Age, Sadat Uddit Amil from The Daily Star, Syed Rashad Imam from the Daily Sun, Khalilur Rahman from Shamakal, Niaz Chowdhury from Prothom Alo, Shahriar Sharief from Unmad, Nasreen Sultana from Unmad, Shikha from Roshalo, Kuddus from Ittefaq, Manik Ratan and Tarik Saifullah who are currently working as freelance cartoonists and many others. The exhibition attracted considerable attention and the press club has been packed with fans since it has been inaugurated. There is amusement on every face as they survey each of the hilarious pieces being exhibited. The cartoonists are pleased with the turnout and hope they can build on what they have started this year. Lets hope their endeavours are successful and wish them the very best for their attention-grabbing and entertaining choice of career.